March 20, 2018 – Medford, Oregon – As a pioneer in developing cannabis products that provide consistent experiences to consumers, Grown Rogue is now making “The Right Experience” products available in CO2 oil cartridge form. 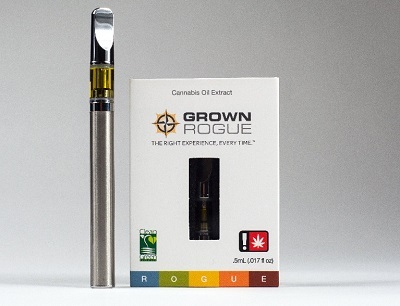 The Grown Rogue CO2 cartridges feature full-spectrum extract oil, providing a complete range of cannabinoids from THC to CBD, CBN and CBG, as well as a rich array of natural terpenes. More people are finding they enjoy and benefit from the synergies these compounds provide. Grown Rogue’s strains correspond to experiences represented by the name ROGUE – Relax, Optimize, Groove, Uplift and Energize. The cartridges are available at dispensaries throughout Oregon. A seed-to-experience company, Grown Rogue has cultivated cannabis hybrids that contain certain ratios of THC and CBD for desired effects in its indoor and outdoor grows. Each hybrid is rigorously tested, and the company provides this information in its regularly updated online strain portfolios. Furthermore, as the company learns more about terpenoids, which are largely affected by the environment, the Grown Rogue cultivation team may implement more measures to control the cultivation process to produce terpenoid ratios capable of crafting a unique cannabis experience. Grown Rogue has initiated the ROGUE Study, which draws experience sampling data from users who sign up to participate in online surveys in real time, pre- and post-consumption. To date, several hundred users have provided instant feedback contributing to the study, which is analyzed by Grown Rogue’s team of scientists in conjunction with research scientists at UC Santa Barbara. It is the first study of its kind, and is providing unique insights that allow for experience prediction that new and returning users appreciate. Those who wish to participate in Grown Rogue’s scientific study can simply register to join the study, log in before and after consuming a Grown Rogue product, record experiences anonymously and receive credits toward future purchases. Grown Rogue is a fully-integrated, seed-to-experience cannabis company, based in Medford, Oregon. The company was founded in 2016 with a vision to bring a community-first approach to the recreational cannabis industry, and elevate the cannabis user experience in Oregon. The Oregon cannabis brand’s line of flower, pre-rolls and extracts including shatter, wax, oil and sugar are categorized according to experiences reflected in the name Rogue – Relax, Optimize, Groove, Uplift and Energize. While other companies’ products are categorized by effect, Grown Rogue is the only company engaging their consumers in a long-term study that captures real-time user feedback. Grown Rogue grows the finest cannabis at its two outdoor and one 17,000 s.f. indoor grow operation, utilizing organic farming practices and meeting all Clean Green Certified standards. All Grown Rogue cultivars are Phylos Certified and offer “The Right Experience, Every Time.”™ For more information, visit www.grownrogue.com.